And having a stool at home (or rather a few) is essential. They are versatile and very practical pieces that take you out of more than one hurry. However, sometimes stools are not too aesthetically pleasing. Today we are going to tell you two DIY stool ideas to decorate them that are simple and very attractive. One for the elderly and one for the smallest of the house. Let’s do it! Surely you have at home one or several Ikea Frosta stools. Yes, that made of birch wood with the circular seat. Its design is more than known, and since it only costs $ 9.99, it is a classic in all houses. Well, here is a DIY idea to customize it and make it an equally functional piece, but much more beautiful. We will decorate it with abstract brushstrokes, very easy to make even for the most neglected with the brushes. 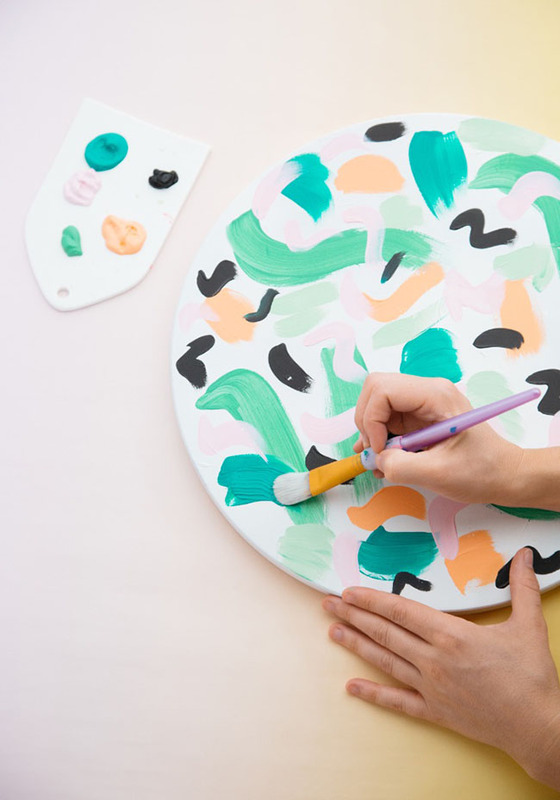 To carry out this work you only need, in addition to the stool in question, white spray paint, acrylic paints of the colors that you like to decorate stools, thick brushes, and a matt or satin spray varnish, to suit the consumer. This DIY work is done with paint to decorate stools cannot be easier. Start by painting the white Frosta stool, spraying it properly with the spray paint. Give short and quick passes while moving the spray on the piece, and ensuring that the result is as homogeneous as possible. Let it dry for about 30 minutes and repeat the process if you see that it is necessary. Then prepare in the palette the colors you will use, depending on the decoration of the space where you will put the stools or your particular tastes. A good idea, before you start is to try a few strokes on cardboard. So you will see if they are too thick or too thin, etc. Once you know how you want to do it, it’s time to move on to the real stool. Apply loose brushstrokes on the white surface of the seat and also on the legs. It is best to work by colors. Start with one and let it dry for 10 minutes before painting with another color, to avoid mixing. When you have finished painting and the paint has dried, it is time to varnish the stool with the spray varnish. Let dry about two hours and you have it ready to use. Another great idea to decorate stools for children is to use paint and adhesive paper. Not only is it the most fun and fun, but you can do it yourself with very little effort. In this case, the Flisat stool was used, also from Ikea ($14.99). Having several in your room is the best thing for when the little friends come to play. 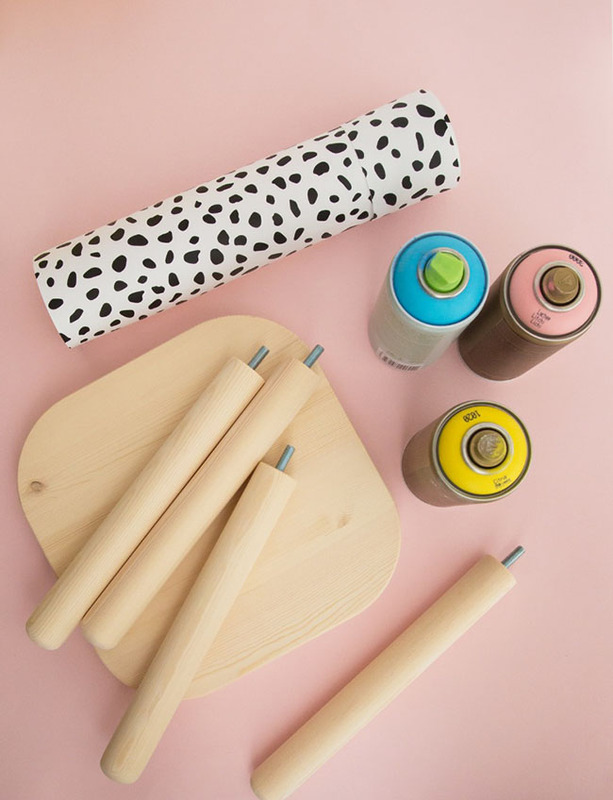 To carry out these DIY stool ideas you will need: the stools (of course), vinyl adhesive paper with a design that you like (in this case a funny paper with animal print has been used), acrylic spray paint of different colors, rule, scissors, and pencil. The Flisat children’s stool has the peculiarity that it is easily assembled and disassembled. To paint the legs you just have to unscrew them, spray them with the spray paint and wait for them to dry. Rate if you need to apply a second coat of paint. Now measure the thickness of the seat and cut a strip of adhesive paper long enough to cover it completely. Then place the seat on the paper to draw its outline and cut it. Glue the paper to cover the seat completely. All that remains is to twist the legs again. Easy, right? As you can see, there is nothing simpler than decorating stools. 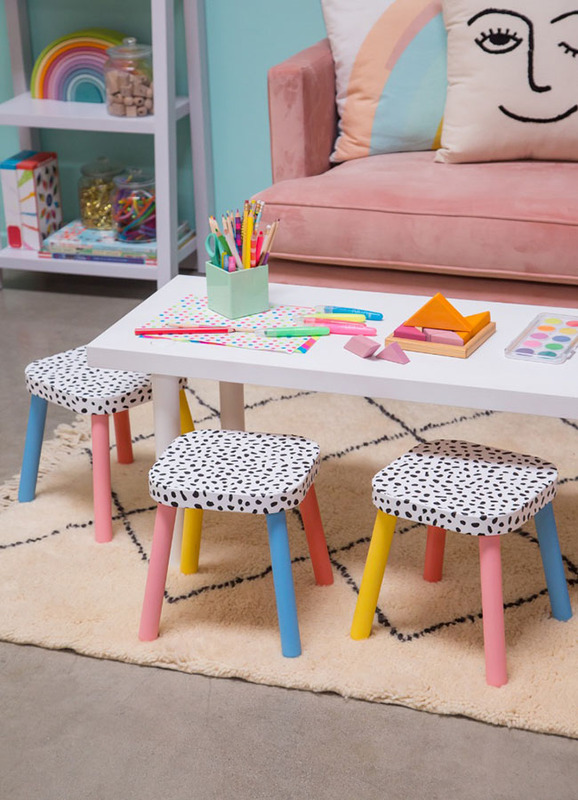 Applying these DIY stool ideas you’ll have plenty of seats when the visits arrive and you can put a note of color with them in any space.